New Year’s resolutions are probably long forgotten, right? If you’ve abandoned the January wish-lists, you can get inspired again by giving yourself the opportunity to try this minimalism challenge everyday. Living your life in a minimalist manner, similar to mindful living, allows you to refocus on what is really important for yourself– and for the planet. 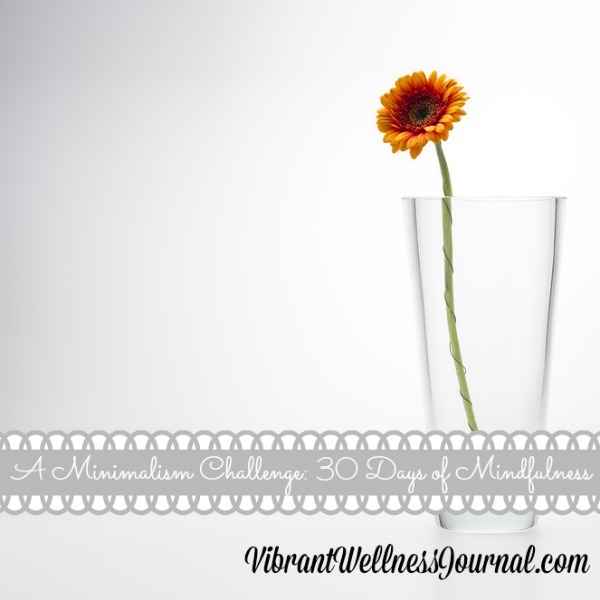 We were inspired by this 30-day Minimalist Challenge from Into-Mind. These daily reminders are a great way to tune into and take control of a consumerist lifestyle. Even better, these minimalism challenges create a greener lifestyle by reducing your spending, eliminating clutter, and reducing your impact on the planet. Here are some of the Minimalism Challenges Into-Mind list and how they can make such a big climate impact. It’s hard to value the time tuned out: it seems like everything needs to happen online or on our phones. But there is a lot of value in tuning electronics OFF. Finding offline activities uses less energy, get your body active, and can help keep you more focused when you ARE online. Sometimes it’s easy to forget that digital clutter is still clutter, and that it uses copious amounts of energy: it makes your computer use more power, and even if you store stuff ‘in the cloud,’ it is using energy on a server somewhere. Time says that the electricity used annually to keep all those photos and apps on an iPhone is 3.5 kWh, with a total of 388 kWh per year, about the same to run a refrigerator. Clean up your cloud, sift through your photos, and reduce your impact! Not to mention all the time you save from scrolling, looking for the right photo. Everybody likes to look good, but many of the products in your daily body care routine are potentially toxic, and contribute plastic, glass, and other waste to your life. Streamline your bathroom time and inventory with your key products and recycle, donate, or toss out the remainder. Hanging onto junk isn’t pretty, but also it makes it you less likely to use what you have. Building a minimalist wardrobe can reduce your footprint and reduce your stress. Find a few key pieces that make you feel your smartest and sexiest and donate the rest, giving your clothes a second life and reducing the need for more purchases overall. This is a truly radical action! But it’s important to help you commit to less in your life. It is a way to break free from common cycles of “emotional spending.” Choosing not shop for one whole day encourages you to plan your meals, bring your own coffee and lunch, and review your shopping trips, leading to reduced car time, less food waste, and less time sitting in traffic. And that part is certainly better for everyone! Anuschka of Into-Mind says, “developing more ethical and less consumerist spending habits is key to living a simpler life.” You can evaluate how those purchases could have been more eco-friendly, with a less negative impact on the environment and society. Was there a more eco way to actually do the shopping (riding a bike, remembering your reusable bags), or better purchases to be made generally (something organic, something local or second-hand?). Chances are, there are less impactful ways to do all your purchases, and being mindful of how we shop can make us better climate citizens. Being mindful of your attachment to STUFF– and learning to let go– can bring calm and stillness into our lives, as you can see from the tips above, it can make a big impact on your carbon footprint too.